Mary Kenny is an experienced journalist, author and broadcaster working in England and Ireland. She has written for over 30 newspapers and magazines over the course of her career. Her books include “Germany Calling”, a personal biography of William Joyce, “Lord Haw-Haw”, (currently commended by the University of the Third Age for the original exploration of Joyce’s Irish background), “Crown and Shamrock: Love and Hate between Ireland and the British Monarchy” (which was used as an information template for Queen Elizabeth’s historic visit to the Irish Republic in 2011), and “Goodbye to Catholic Ireland”, a social history of Ireland over the lifetime of her parents. Her play “Allegiance”, about Winston Churchill’s private meeting with Michael Collins in 1921, was performed at Edinburgh (and has since toured in Ireland). At Edinburgh, Michael Fassbender played Collins (and the late Mel Smith was Churchill). 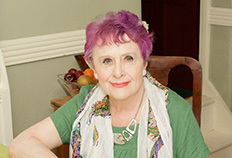 Mary wrote a “selective memoir” in 2013, “Something of Myself – and Others”, which included a long autobiographical essay about being a carer for her husband, Richard West, after he suffered from a stroke. (Richard, a noted journalist and author, died in 2015.) “A Day at a Time,” is a collection of reflections, published in December 2016. Mary writes a column for the Irish Independent Magazine each Saturday on a wide range of issues – personal, historical and culture – as well as publishing in the Catholic Herald and the Irish Catholic newspaper. She also writes an advice column in the monthly magazine The Oldie, and welcomes questions, answers, comments and complaints…. See also standard reference book: “Who’s Who”. Mary Kenny is an experienced public speaker and would be happy to speak at libraries and bookshops on the subject of Lord Haw-Haw, and related topics. We met at a conference organised by the Medical Ethics Alliance in 2015. I am holding a nursing conference on ‘the nurse as patient advocate’ on 8 May 2017. You would be most welcome to join us at the Royal College of Nursing (10.30 – 4.15). Teresa Lynch RGN, MSc, Dip Nurse Ed.